EZee Life™ is a line of home health care products distributed by HPU Rehab in Toronto, Ontario. The EZee Life™ products are primarily bathroom safety products and mobility products and have recently added a line of rollators to their line. One of their new rollators is known as the Transporter (CH3040) rollator and is an advancement on other rollator designs in that it can quickly and easily be converted into a transport chair so the user can safely be pushed around by their caregvier if they are too tired to continue walking with it set up as a rollator. Handle Height Range: 31" to 34½"
Basket Size: 8" x 15¾" x 6"
The CH3040 rollator is an economically priced aluminum folding walker that is primarily both for indoor and outdoor use that can easily and quickly converted into a lightweight transport chair that a caregiver can use to transport the user with if they become fatigued. While using a conventional rollator to carry the user on is not recommended and can cause the walker to tip over the EZee Life™ CH3040 rollator is designed to provide this option. By flipping down the footrest and removing the padded backrest bar and inserting it to the opposite side of this rollator walker, the CH3040 becomes a wheeled transport chair with a footrest, backrest bar and seat. The user sits on the rollator seat facing forward when used as a transport chair and sits on the eat facing backward when simply used as a seat to rest on in the normal rollator configuration. 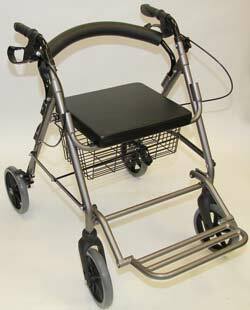 This lightweight rollator features a flip up PVC padded seat, basket, hand brakes, 8" front swivel wheels and has a weight capacity of 250 lbs. 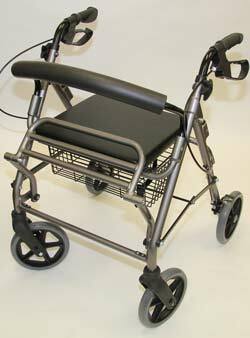 The overall width of 22" will allow this walker to be easily manoeuvrable even in the tightest places. The handle height is easily adjustable without the need of tools from a lowest height of 31" to a maximum handle height of 34¾". This height should be suitable for user between 5' 4" to 6' in height.